by Freeman, Robert J.; Shoulders, Craig D.; McSwain, Dwayne N.; Scott, Robert B. 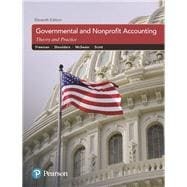 For courses in governmental and nonprofit accounting. Written through the eyes of the learner, Governmental and Nonprofit Accounting prepares you for professional government, not-¿for-¿profit accounting practice, and the CPA exam. This comprehensive, up-to-date textbook covers state and local government, federal government, and not-for-profit organization accounting, financial reporting, and auditing, and prepares you well for real-world practice. The 11th Edition emphasizes that what you learn in the accounting classroom should correlate highly with what you must understand and apply on the CPA exam and as professional accountants. Its updated content reflects recent changes that have had significant impact on the world of accounting today. Greg Allison continues to make monumental contributions to the governmental accounting profession and education in his roles at the University of North Carolina at Chapel Hill. The demands on his time continue to be immense. He recently contributed to the development of an online Masters of Accounting program at the university in addition to his work with the School of Government, the North Carolina Local Government Commission, and governments throughout the state and beyond. Greg has made valuable contributions to the text in the more than 10 years he has served as a co-author. G. Robert Smith, Jr., better known as “Smitty,” has retired after a long and successful career during which he made valuable contributions not only to the universities and students he served but to the governmental accounting profession as well. Smitty held leadership roles in the Government and Not-for-Profit Section of the American Accounting Association, including serving as its president. He also served on the Governmental Accounting Standards Advisory Council, participated in multiple roles with the AICPA, and regularly provided continuing professional education for CPAs and government officials. Smitty accomplished all of this even during the time that he was serving as the accounting department head at Middle Tennessee State University. One of the contributions to this text that has left its mark and that we value greatly is Smitty’s introduction of the two-worksheet approach to converting fund financial statement information into government-wide financial statement information. This is an effective approach for helping students (and practitioners) understand the conversion process. We wish Smitty the very best in his Tennessee mountain retirement. Dwayne McSwain, currently a member of the accounting faculty at Sam Houston State University, is a well-known and well-respected member of the governmental accounting and auditing specialists within academe. He has had extensive experience in both governmental accounting roles and as a public school district finance director before entering the professorial ranks. Dwayne also co-authored a significant practitioner guide for several years. This extensive background and his publishing experience make Dwayne a valuable addition to our authorship team. Robert Scott, the chief financial officer and assistant city manager of the city of Carrollton, Texas, is among the most talented and respected CPAs in government today. He has been recognized as the outstanding CPA in government by the AICPA (2008) and serves on its State and Local Government Expert Panel. Bob has served the Government Finance Officers Association (GFOA) in many capacities, including as a member of its Executive Board, and is an outstanding continuing professional education instructor who has authored or co-authored well-regarded continuing education courses. Bob, like Dwayne, is a valuable addition to the author team. Both have made meaningful contributions to this edition.